NEWS DESK: Prince Karim Aga Khan, the 49th imam and spiritual leader of the Shia Ismaili Muslims, is scheduled to arrive in Islamabad today (Thursday) for an official visit. Prime Minister Shahid Khaqan Abbasi had officially invited the Aga Khan IV. He is expected to meet his followers in Chitral and Gilgit-Baltistan on December 9 and December 10, respectively. Moreover, he will stay in Karachi from December 15 till December 19. He is also expected to meet President Mamnoon Hussain and Prime Minister Abbasi along with other government leaders, said a news release. The visit is part of a series of visits that coincides with the commemoration of the Aga Khan IV’s Diamond Jubilee, which began on July 11 this year and will continue till July 11, 2018. The Diamond Jubilee marks 60 years of his Imamat as the spiritual leader of the Shia Ismaili Muslim community. Prince Karim acceded to the Ismaili Imamat on July 11, 1957, succeeding his grandfather, Sir Sultan Mahomed Shah Aga Khan. 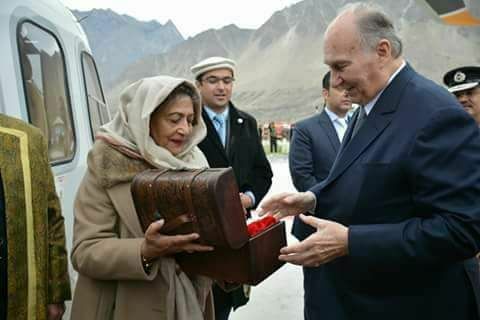 The Aga Khan IV, a direct descendant of the Holy Prophet (peace be upon him) through his daughter Fatima and son-in-law Ali, visited a village in Skardu as well as Hunza in 2006 along with Prince Charles of Britain and the Duchess of Cornwall. 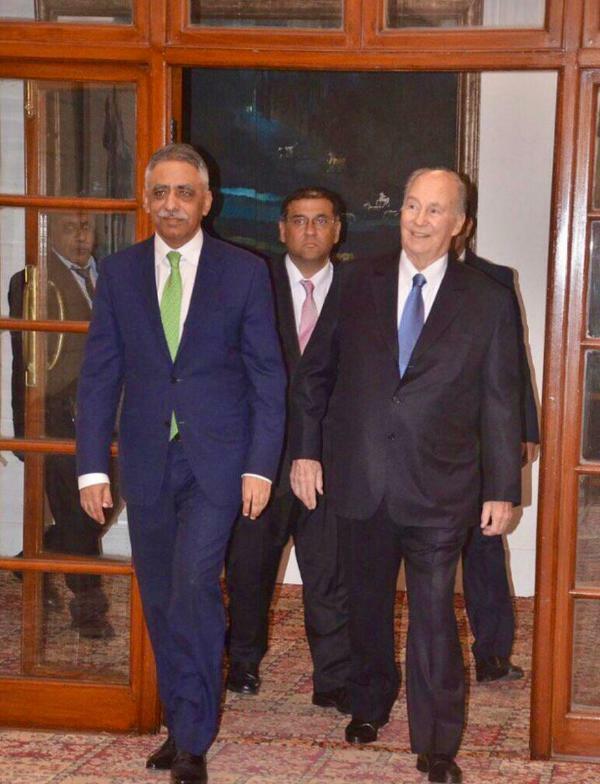 Islamabad, Dec. 7 (TNS): Prince Karim Aga Khan arrived in Islamabad on Thursday evening. Foreign minister Khawaja Asif, CADD minister Tariq Fazal Chaudhry and other officials received the guest on Islamabad airport. Later on, foreign minister Khawaja Asif and Prince Karim Aga Khan hold meeting and discussed various matters. Prince Karim Aga Khan arrived in Islamabad for an official visit at the invitation of the Government of Pakistan. This visit is part of a series of visits that coincides with the commemoration of the Aga Khan’s Diamond Jubilee, which began earlier this year on 11th July. The Diamond Jubilee marks 60 years of his Imamat as the spiritual leader of the Shia Ismaili Muslim community. The Aga Khan acceded to the Ismaili Imamat on 11th July 1957, succeeding his grandfather, Sir Sultan Mahomed Shah Aga Khan. 2017-12-06 Can u see the lights all over mountains written Ali Mowla..welcome our imam. This is all done by our scouts. The carry generators fuel with them and do rotation duty of 2 each for 6 hours in night and sit at mountains to lit up these lights. I am so happy to see the people here who are in love of Mowla and waiting to welcome him. Mawlana Hazar Imam arrived in Pakistan Thursday evening for his Diamond Jubilee visit, accompanied by Princess Zahra. Upon Hazar Imam's arrival at the Nur Khan Airbase in Islamabad, he was received by the Minister for Foreign Affairs, Khawaja Asif, the Minister of State for Capital Administration and Development, Tariq Fazal Chaudhry, as well as the President of the Ismaili Council for Pakistan, Hafiz Sherali. Leaders of AKDN and Jamati Institutions in Pakistan were also present at the airport to receive Hazar Imam. Mawlana Hazar Imam and Princess Zahra were welcomed by over 200 junior scouts and guides enthusiastically waving national, Ismaili, and Diamond Jubilee flags. They were then presented with bouquets by young Ismaili students from Sargodha before departing the airbase. Mawlana Hazar Imam and Princess Zahra are visiting at the invitation of the Government of Pakistan on the occasion of the commemoration of the Diamond Jubilee. While on this historic visit, Mawlana Hazar Imam is expected to grace the Jamat across the country with darbars and mulaqats. A new set of Stamps issued y Pakistan Post Offices to commemorate the arrival of H.H. The Aga KHan and his Diamond Jubilee. President Mamnoon Hussain Friday said that Prince Karim Aga Khan was rendering invaluable services for global peace and stability, brotherhood, tolerance as well as for the welfare of humanity in different parts of the world, including Pakistan. The president said this while talking to Prince Karim Aga Khan, who along with his daughter Princess Zahra Aga Khan and a delegation called on him at the Aiwan-e-Sadr here. On his arrival at Aiwan-e-Sadr, President Mamnoon warmly received Prince Karim Aga Khan that followed the guard of honour. Minister for CADD Dr Tariq Fazal Chaudhry, Foreign Secretary Tehmina Janjua and senior officials were also present in the meeting. The president said that Aga Khan Foundation was rendering commendable services in the fields of education, health and for rural development in various parts of the country. He asked Prince Karim Aga Khan to extend the development activities of AKDN in other parts of the country apart from Sindh and Northern Areas which was agreed to by the visiting dignitary. President Mamnoon appreciated the services of Aga Khan Foundation during the 2005 earthquake and noted that his Grandfather Sir Sultan Muhammad Shah Aga Khan was a very close companion of the Founder of the Nation Quaid-e-Azam Muhammad Ali Jinnah, who rendered valuable services during the freedom movement. 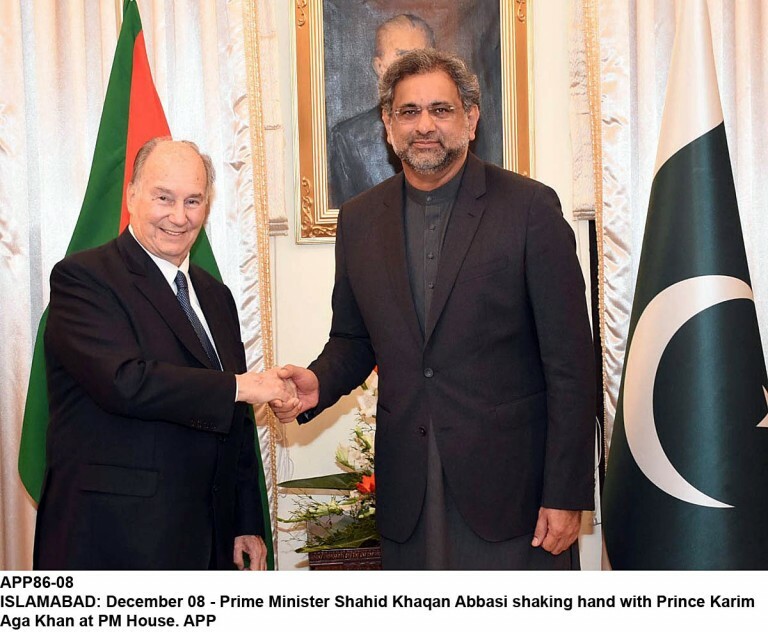 While thanking the president for warm welcome, Prince Karim Aga Khan said that he was thankful to the people and Government of Pakistan for the warm hospitality. ISLAMABAD: Prime Minister Shahid Khaqan Abbasi has lauded the role of Prince Karim Aga Khan for promotion of peace and interfaith harmony and his valuable contribution towards social, economic and cultural development of Pakistan. He expressed these views on Friday at the Prime Minister House when Aga Khan called on him. Prince Karim Aga Khan was accompanied by his daughter Princess Zahra Aga Khan as well as senior representatives of Aga Khan’s welfare organisations including Hafiz Sherali, President Council for Pakistan, Sultan Allana, ambassador Arif Lalani, head of the diplomatic department, seat of the Ismaili Imamat, Firoz Rasul, President Aga Khan University, and Iqbal Walji, Chairman National Committee Aga Khan Foundation, Pakistan. 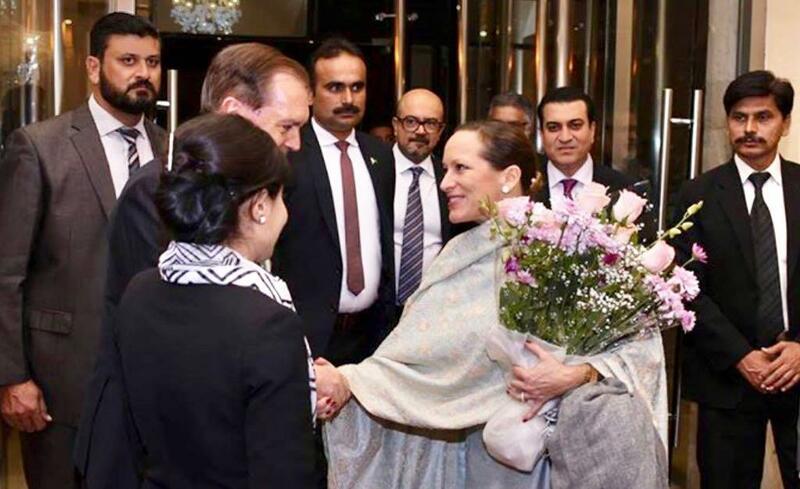 Warmly welcoming the Prince and members of the visiting delegation, the prime minister appreciated Aga Khan’s role for promoting peace and interfaith harmony among Muslims, and his valuable contributions towards social, economic and cultural development of the country. He re-affirmed his support for the AKDN institutions in furthering their development goals. The prime minister also presented a special first day cover consisting of six stamps illustrating the contribution of AKDN in the country. The stamps commemorate the diamond jubilee -- or 60 years -- of the Imamat of Aga Khan. The prince reiterated his longstanding commitment to development goals and improving the quality of life of the people of Pakistan. He thanked the government for its support towards the work of the AKDN. He offered to build a university and a nursing college in collaboration with the government of Pakistan in the capital city of Pakistan. Later, the prime minister hosted Aga Khan, Princess Zahra Aga Khan and the AKDN delegation to a banquet at the PM House. Minister of State for CADD Dr Tariq Fazal Chaudhry, SAPM Ali Jahangir Siddiqui, SAPM Miftah Ismail, Secretary to PM Fawad Hassan Fawad, Foreign Secretary Tehmina Janjua and senior officials attended the meeting. Meanwhile, outgoing ambassador of Turkey Sadik Babur Girgin paid farewell call on Prime Minister Abbasi at the PMO. The prime minister commended the ambassador for his efforts and contributions towards further strengthening the existing cordial and brotherly relations between the two countries. The prime minister conveyed his good wishes for the Turkish leadership as well as for progress and prosperity of the people of Turkey. He wished the ambassador success in his future endeavours. Ambassador Girgin thanked the prime minister for the warmth and hospitality extended to him during his stay in Pakistan. Meanwhile, Prime Minister Abbasi directed the Benazir Income Support Programme (BISP) to chalk out a comprehensive graduation strategy to enable and equip its beneficiaries earn their own livelihood. Chairing a meeting on the BISP here at the PM Office, the prime minister approved a proposal for setting up an endowment fund for the BISP to ensure fiscal continuity in lean budgetary periods and said it would act as a catalyst in generating income for supporting various development schemes on the fund structure. The meeting was attended by BISP Chairperson Marvi Memon, Secretary to Prime Minister Fawad Hasan Fawad, Secretary BISP Omar Hamid Khan and senior officers of the BISP. The prime minister was briefed about various initiatives being undertaken under the umbrella of the BISP including unconditional cash transfer programme and Waseela-e-Taleem programme that has so far benefited 5.6 million families and 1.8 million children respectively. The prime minister was informed that the international community, donors and developmental partners including the ADB, WB and DFID have reposed confidence in transparency and effectiveness of the programme in reaching out to the poorest of the poor and helping them break shackles of poverty. The meeting was informed that after successful completion of pilot phase in four districts and door-to-door survey in 10 districts, the National Socio-economic Registry (NSER) survey would be rolled out in the remaining districts of the country in February 2018 and would be completed by May 2018. The premier also interacted with students from Balochistan Residential College Loralai at the PM Office as part of the initiative to invite young leaders to the highest offices and brief them about the functioning of the government. The prime minister inquired the students about their education and also answered their questions. Abbasi said the government was focusing on development of Balochistan and socio-economic uplift of its people. The students thanked the prime minister for providing them an opportunity to visit the PM Office for an interaction. ISLAMABAD – President Mamnoon Hussain said that Prince Karim Aga Khan was rendering invaluable services for global peace and stability, brotherhood, tolerance as well as for the welfare of humanity in different parts of the world, including Pakistan. The president said this while talking to Prince Karim Aga Khan, who along with his daughter Princess Zahra Aga Khan and a delegation called on him at the President House here on Friday. 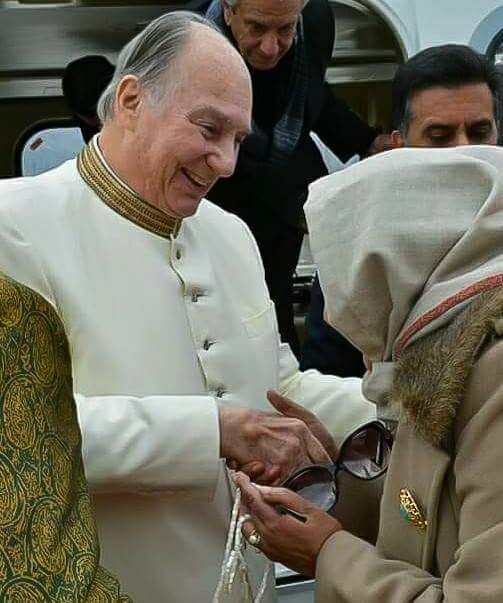 The spiritual leader of Ismailia community Prince Karim Aga Khan has arrived in Islamabad on a state visit at the invitation of the Government of Pakistan. Ensuring development in country’s various sectors, Prince Karim Aga Khan said that efforts in health, education and rural development sectors will be further intensified in Pakistan. He also vowed to launch programs dedicated to alleviate poverty in underdeveloped areas. 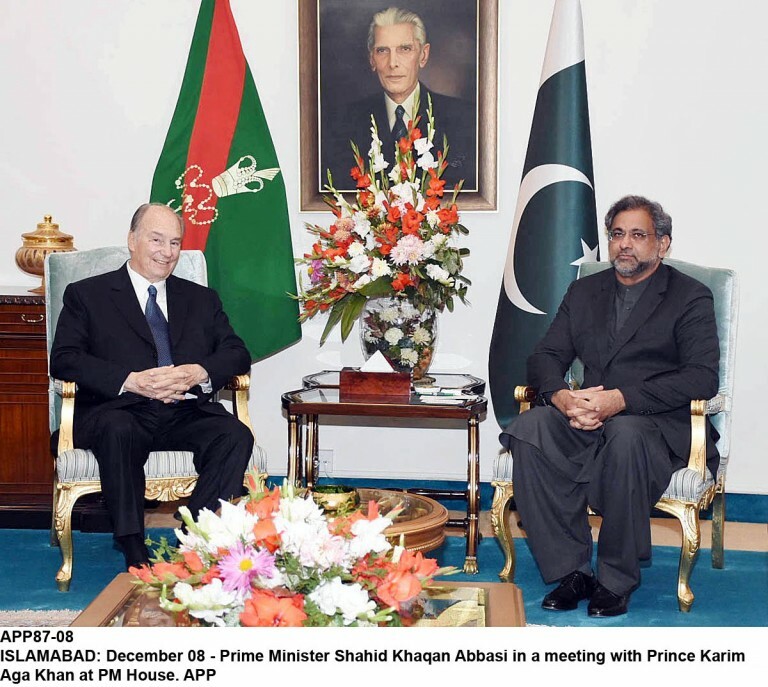 Prince Karim Aga Khan also called on Prime Minister Shahid Khaqan Abbasi. Warmly welcoming, the prime minister appreciated his role in promoting peace and interfaith harmony among Muslims and his valuable contributions toward the social, economic and cultural development of the country. 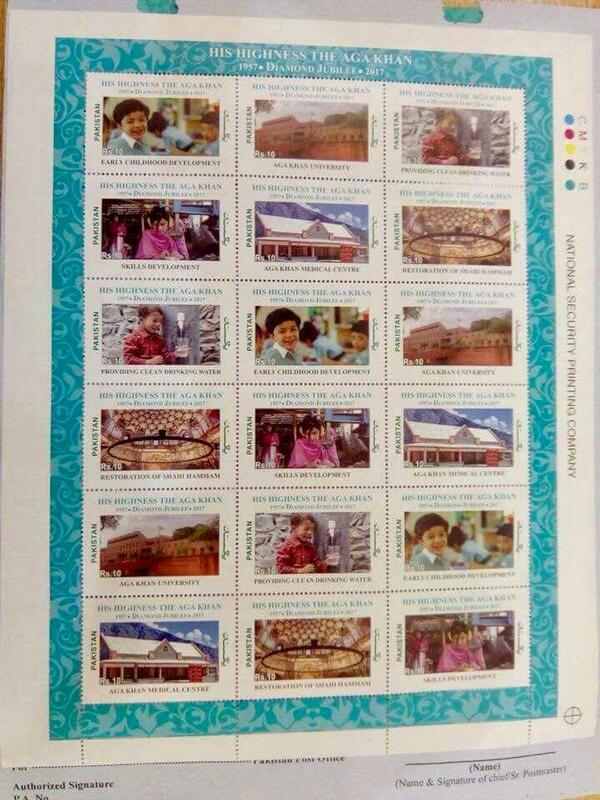 The prime minister also presented a special First Day Cover consisting of six stamps illustrating the contribution of the AKDN in the country. The stamps commemorate the Diamond Jubilee – or 60 years – of the Imamat of His Highness the Aga Khan. 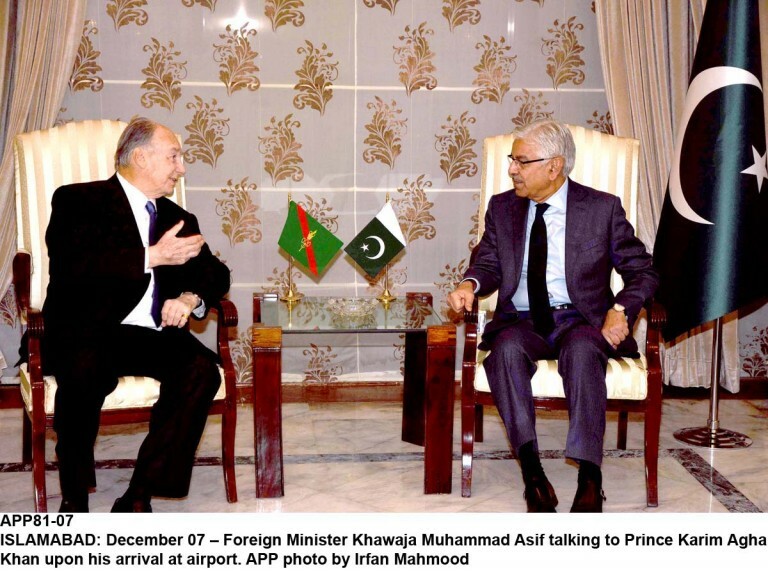 Arriving upon the President’s invitation, Prince Karim Aga Khan flew to the country’s capital on Thursday where he was received by Minister for Foreign Affairs Khawaja Mohammad Asif, Minister for Capital Administration and Development Division (CADD) Dr Tariq Fazal Chaudhry and Mayor of Islamabad Sheikh Anser Aziz. As part of his official visit to Pakistan, Prince Karim Aga Khan is scheduled to meet his followers in Karachi, Islamabad and Gilgit-Baltistan as well as other parts of the country to mark his Diamond Jubilee Celebrations – 60th anniversary of his Imamat of the Ismaili community. Chitral .. 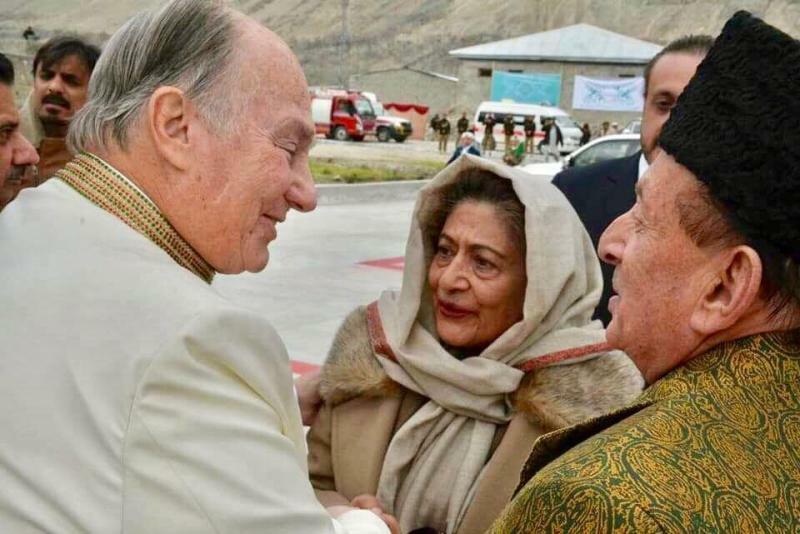 The grand occasion of the visit of their spiritual leader Prince Karim Aga Khan has finally arrived for the Ismaili community of Chitral which constitute about one third of the entire population of the district. Volunteers from the community have been working day and night for weeks on, to clean the area and upgrade roads and prepare two grand ‘deedar gahs’ (congregation areas) at Booni and Garam chashma, which will hold thousands of disciples of the Imam of the Ismailia community. Ismailis from all over Chitral with their women folk and children have converged on Booni and Garam Chashma the two venues where the Ag Khan would address his followers. The scathing cold has not deterred the faithful to brave the weather and catch a glimpse of their Imam. 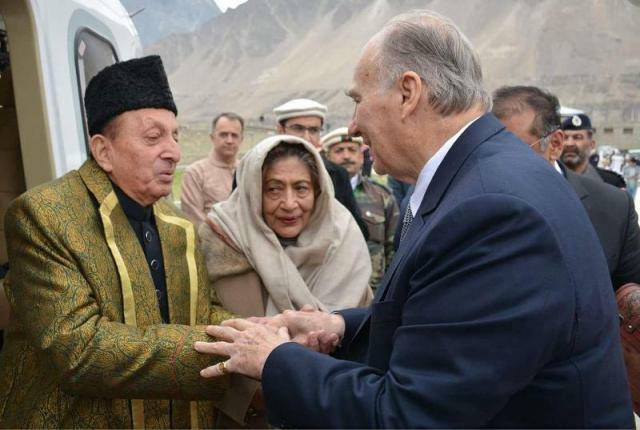 Spiritual leader of the Ismaili community Prince Karim Aga Khan on Saturday visited the Khyber-Pakhtunkhwa’s Chitral district and addressed his thousands of followers, who had gathered at Garam Chashma and Boni areas. 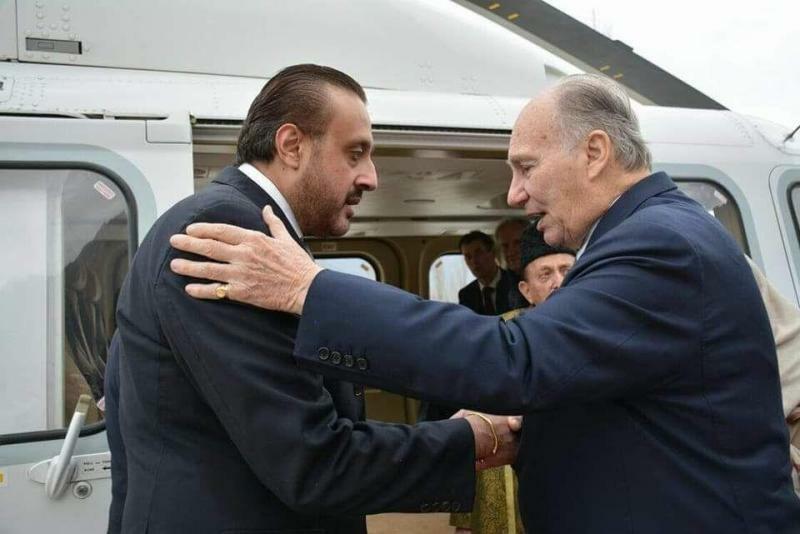 Prince Karim, who arrived in Pakistan on Thursday and earlier held meetings with President Mamnoon Hussain and Prime Minister Shahid Khaqan Abbasi, was scheduled to reach the mountainous valley from Islamabad on his special C-130 plane. However, due to bad weather, the Aga Khan arrived in the valley three hours late on the helicopter of the Aga Khan Foundation. At the airport, he was welcomed by MNA Iftikharuddin, District Nazim Maghfirat Shah, Malakand’s Commissioner Zaheerul Islam, Regional Police Officer Akhtar Hayat and Commandant Chitral Task force Colonel Moinuddin. Special arrangements were made at Garam Chashma and Boni to accommodate respectively 60 thousand and 80 thousand people, who had gather from different areas to see their 49th Imam. Addressing his followers, Prince Karim laid emphasis on education and said peace and law and order were necessary for progress of the region. “Islam is the religion of peace and love, and we should give priority to these aspects over all other things,” he added. 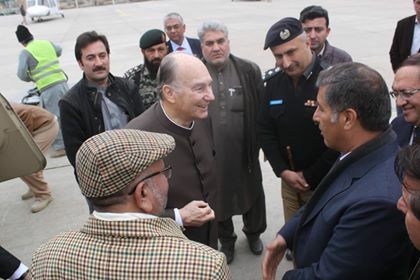 At the airport, the Chitral nazim briefed Prince Karim on the area’s issues and highlighted the importance of establishing both air and road links between Chitral and Khorugh area of Tajikistan. Shah said these arrangements were very important for progress of the area. Prince Karim said Chitral held a special place in his heart and that he was well aware of the issues of the area. The prince later stayed the night at the valley. Beautiful pics of H.H. The Aga Khan on 9th December 2017 at arrival in Chitral. 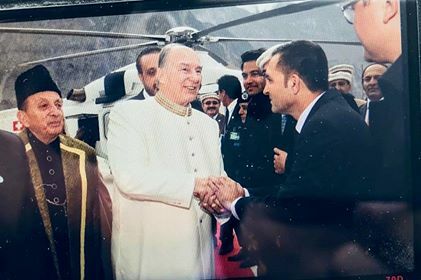 CHITRAL: Prince Karim Aga Khan, spiritual leader of the Ismaili community, on Saturday said that peace was a must for the development of the region. He was addressing his followers in Booni and Garum Chashma. In his address, Aga Khan stressed the importance of education and linked peace to the development of the region. He said that Islam was the religion of peace and its followers must follow the instructions of Islam for the progress and prosperity of the entire Muslim world. Around 60,000 followers had gathered at Garum Chasma and 80,000 in Booni to listen to their spiritual leader. The spiritual leader of Ismaili community said that he had a strong bond with Chitral and was aware of the problems of the area. 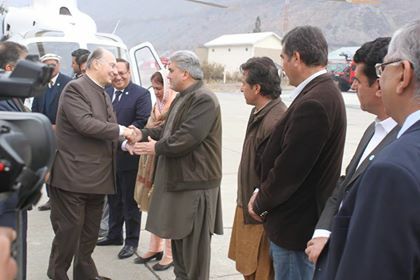 Earlier, Member National Assembly Shahzada Iftikharuddin, District Nazim Maghfirat Shah and government officials received Prince Karim Aga Khan at the Chitral Airport. He was scheduled to reach Chitral on C-130. However, his arrival was delayed by three hours due to inclement weather and he reached the district via helicopter. 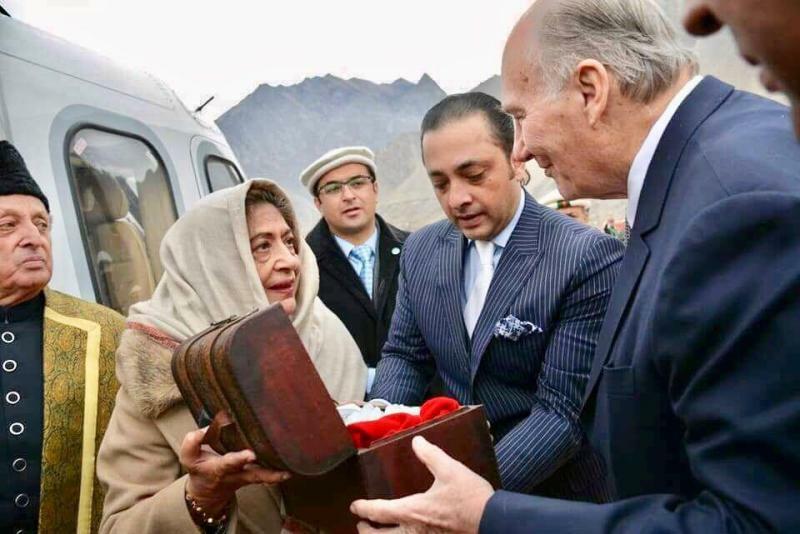 Mawlana Hazar Imam arrived in Chitral earlier today, as part of his Diamond Jubilee visit to Pakistan. Shahzada Iftikharuddin, Member of the National Assembly, Khyber Pakhtunkhwa, Syed Zaheer ul Islam, Commissioner Malakand Division, Maghfirat Shah, District Nazim Chitral, Colonel Moinuddin, Commandant Chitral Scouts, Akhter Hayat, DIG Malakand Division, Salim Khan, MPA and others welcomed Mawlana Hazar Imam at the Chitral Town airport. The receiving delegation remarked that the visit of Hazar Imam was a blessing and a historical moment for the people of Chitral. They further applauded the services of the Aga Khan Development Network (AKDN), for its longstanding commitment to the region and the significant role it has played in its development. Over several decades, AKDN agencies have invested in the areas of education, health, emergency response and disaster preparedness, infrastructure and rural development in Chitral. Mawlana Hazar Imam thanked the Commissioner, observing that much had been achieved towards the development of Chitral and that efforts would continue to be made towards the improvement of the quality of life for all. The Diamond Jubilee marks 60 years of the Imamat of Mawlana Hazar Imam, as the Spiritual Leader of the Shia Ismaili Muslim community. Mawlana Hazar Imam met with His Excellency President Mamnoon Hussain at the Aiwan-e-Sadr in Islamabad on 8 December 2017. On the first full day of his Diamond Jubilee visit to Pakistan, Mawlana Hazar Imam, accompanied by Princess Zahra, called on His Excellency President Mamnoon Hussain at the Aiwan-e-Sadr, Pakistan’s Presidential Palace. Upon his arrival, Mawlana Hazar Imam and President Hussain observed a performance of the Pakistan National Anthem, before Hazar Imam was invited to review a Guard of Honour. In their meeting that followed, His Excellency the President warmly welcomed Mawlana Hazar Imam and Princess Zahra, thanking them for their commitment to Pakistan which dates back to the time of Mawlana Sultan Mahomed Shah. This evening, Mawlana Hazar Imam will meet with H.E. Shahid Khaqan Abbasi, Prime Minister of Pakistan who is hosting a banquet in honour of Hazar Imam. Mawlana Hazar Imam met with the Prime Minister of Pakistan His Excellency Shahid Khaqan Abbasi at the Prime Minister’s House on 8 December 2017. The Prime Minister presented a special First Day Cover set of commemorative stamps celebrating the Diamond Jubilee of Mawlana Hazar Imam, and illustrating the contribution of AKDN agencies in the country. Mawlana Hazar Imam called on His Excellency Shahid Khaqan Abbasi at the Prime Minister’s House, accompanied by Princess Zahra, as well as senior Imamat representatives. Upon arrival, the Prime Minister welcomed Mawlana Hazar Imam and Princess Zahra to Pakistan. Reiterating the Ismaili Imamat’s longstanding commitment to the country’s development goals, Mawlana Hazar Imam thanked the government and its partners for their support and collaboration towards the work of the Aga Khan Development Network (AKDN). The Prime Minister also presented a special First Day Cover set of commemorative stamps celebrating the Diamond Jubilee of Mawlana Hazar Imam, and illustrating the contribution of AKDN agencies in the country. The selection of six stamps, issued by the Government of Pakistan, specifically highlights AKDN’s achievements in the areas of education, health, environment, rural skills development and preservation of culture. Later in the evening, Prime Minister Abbasi hosted Mawlana Hazar Imam, Princess Zahra and the Imamat delegation to a banquet at the Prime Minister’s House. GILGIT: Joint Consultancy Group to be formed in order to streamline and foster the cooperation between the Government of Gilgit-Baltistan and the Aga Khan Development Network (AKDN). 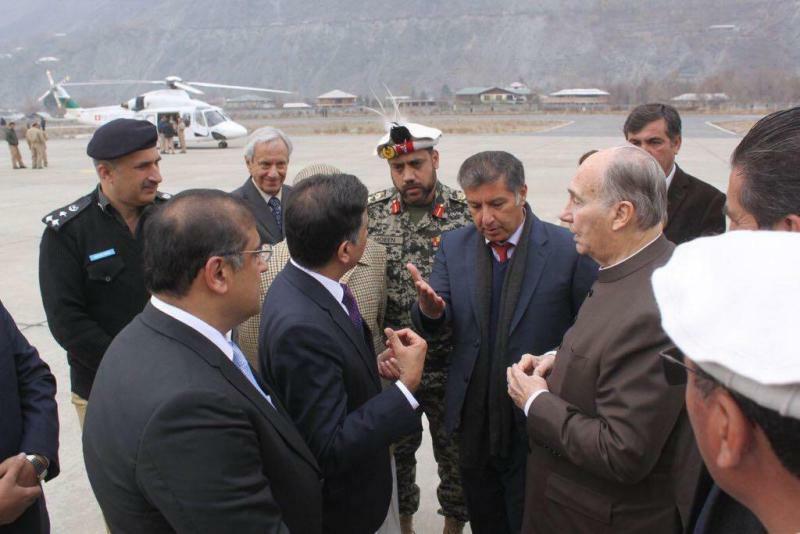 His Highness Prince KArim Aga Khan proposed the formation of this joint working group during a meeting with Chief Minister Gilgit-Baltistan Hafiz Hafeez Ur Rehman and other civil and military officials in Gilgit on Sunday. Chief Minister apprised His Highness about various steps taken for maintaining peace and improving the livelihoods of the people of Gilgit-Baltistan. The meeting was also participated by Force Commander Northern Areas Major General Saqib Mahmood Malik , Chief Secretary Gilgit-Baltistan Dr Kazim Niaz and other officials. Earlier the day, His Highness Prince Karim Aga Khan visited Yasin and Hunza and addressed huge gatherings of his followers. Joint Consultancy Group to be formed in order to streamline and foster the cooperation between the Government of Gilgit-Baltistan and the Aga Khan Development Network (AKDN). 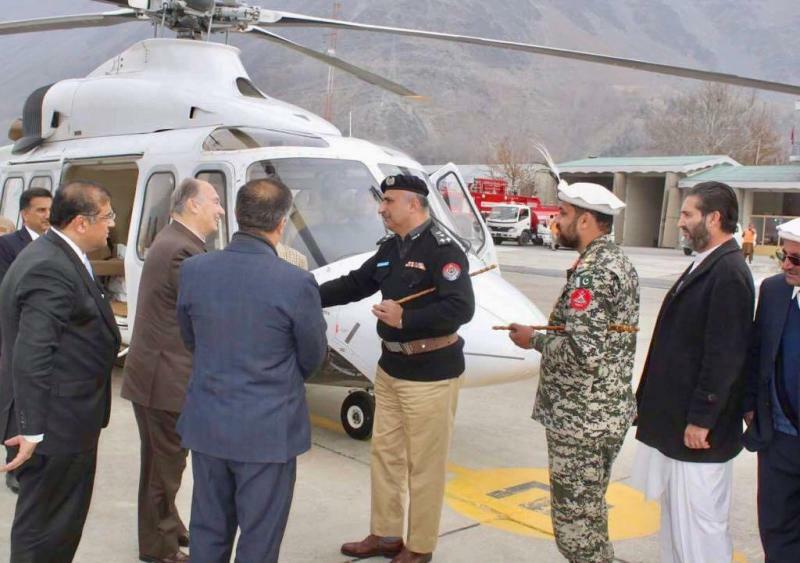 His Highness Prince KArim Aga Khan proposed the formation of this joint working group during a meeting with Chief Minister Gilgit-Baltistan Hafiz Hafeez Ur Rehman and other civil and military officials in Gilgit on Sunday. Chief Minister apprised His Highness about various steps taken for maintaining peace and improving the livelihoods of the people of Gilgit-Baltistan. The meeting was also participated by Force Commander Northern Areas Major General Saqib Mahmood Malik , Chief Secretary Gilgit-Baltistan Dr Kazim Niaz and other officials. 2017-12-10 - Earlier today, His Highness Prince Karim Aga Khan visited Yasin and Hunza and addressed huge gatherings of his followers. 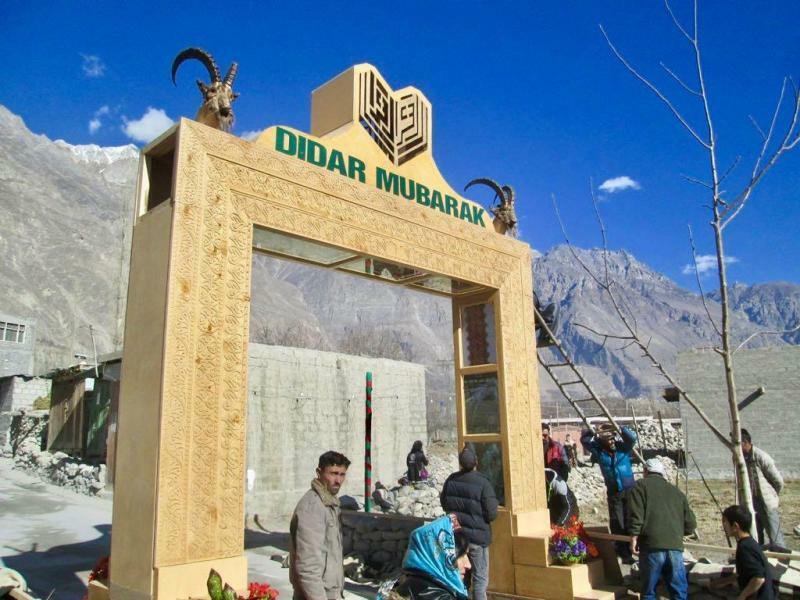 Didar Mubarak to all Jamats from Yasin and Hunza area. As we get the photos, we will share with you here. Joint Consultancy Group to be formed in order to streamline and foster the cooperation between the Government of Gilgit-Baltistan and the Aga Khan Development Network (AKDN). 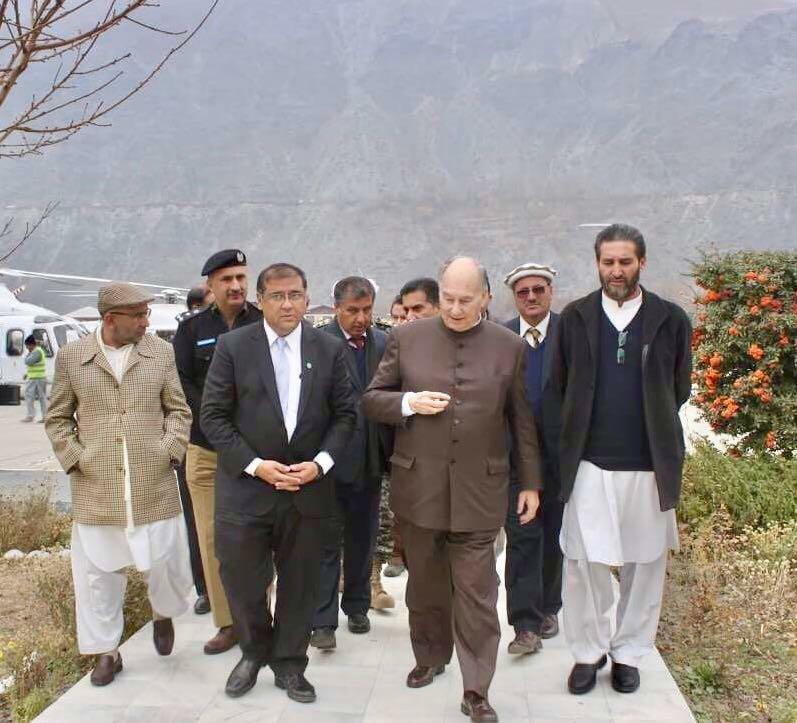 His Highness Prince KArim Aga Khan proposed the formation of this joint working group during a meeting with Chief Minister Gilgit-Baltistan Hafiz Hafeez Ur Rehman and other civil and military officials in Gilgit on Sunday. His Highness Prince Karim Aga Khan being received by Governor Giglit-Baltistan Mir Ghazanfer Ali Khan upon his arrival in Hunza on Sunday. 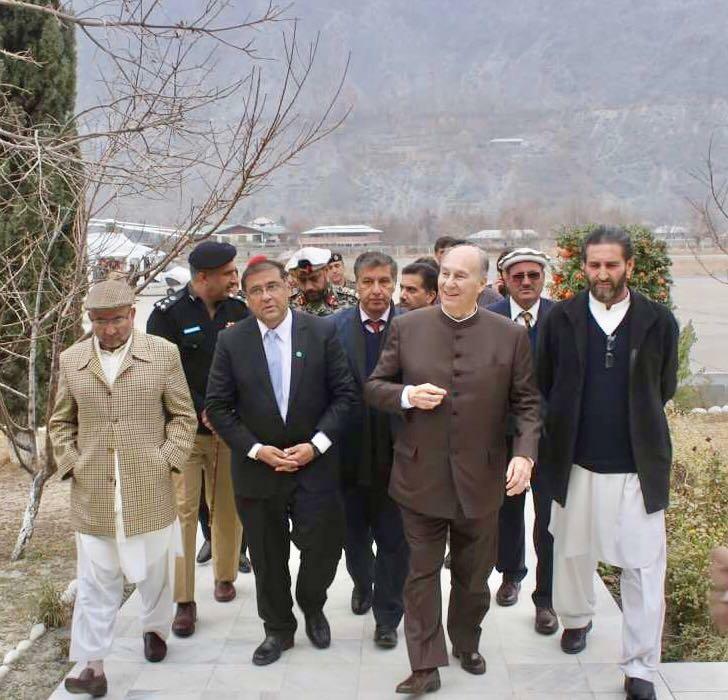 CHITRAL: Prince Karim Aga Khan, the spiritual leader and 49th Imam of the Shia Ismaili community, visited on Saturday the Chitral district in Khyber-Pakhtunkhwa. He addressed his followers, who had gathered in thousands at Garam Chashma and Boni areas. Prince Karim arrived in Islamabad on an official visit to the country on the invitation of Prime Minister Shahid Khaqan Abbasi on Thursday. Minister for Foreign Affairs Khowaja Mohammad Asif, Minister for Capital Administration and Development Division (CADD) Dr Tariq Fazal Chaudhry and Mayor of Islamabad Sheikh Anser Aziz received him at the airport. 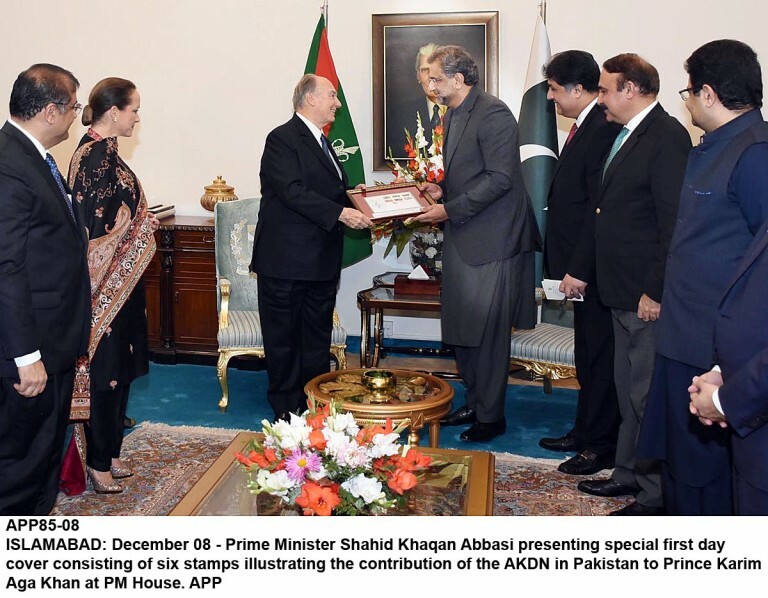 Prime Minister Shahid Khaqan Abbasi had officially invited the Aga Khan IV. On Saturday, Prince Karim, who earlier held meetings with President Mamnoon Hussain and Prime Minister Shahid Khaqan Abbasi, was scheduled to reach the valley from Islamabad on a C-130 plane. However, he reached the valley three hours late on the helicopter of the Aga Khan Foundation due to the weather. Special arrangements had been made at Garam Chashma and Boni to accommodate 60,000 and 80,000 people, respectively, who had gathered from different areas to see their 49th Imam. Addressing his followers, Prince Karim said peace and law and order were necessary for progress of the region. “Islam is the religion of peace and love, and we should give priority to these aspects over all other things,” he added. At the airport, the Chitral nazim briefed him on the area’s issues and highlighted the importance of establishing both air and road links between Chitral and Khorugh area of Tajikistan. He said these arrangements were very important for the progress of the area. 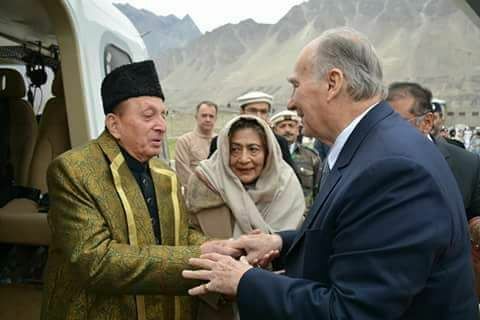 GILGIT: Prince Karim Aga Khan, the spiritual leader of the Ismaili community, reached Gilgit-Baltistan on Sunday, where he addressed huge congregations of followers in Yasin valley of Ghizer district and Hunza Aliabad. Floral gates had been erected to the Didargahs (the glimpsing places), which were well-carpeted. About 100,000 followers were estimated to be in attendance in the Yasin valley congregation. After performing the ritual of Didar in Yasin valley, Aga Khan arrived in Hunza Alibad at noon for performance of second Didar, where he delivered the sermon to a large congregation. It was compulsory for each participant to have an invitation card in order to be able to attend the Didar. The community is celebrating the golden jubilee of the imamat of Prince Karim Aga Khan. During his sermons, Aga Khan, also known as Shah Karim al-Hussani, suggested his followers to remain loyal to Pakistan and play their role for religious harmony. He said morality, education and peace were tools for success. He assured to play his role for development of remote areas of the country. “Agha Khan Development Network will continue its services for betterment of people in the region,” he said. The Ismaili community’s spiritual leader is on a 13-day visit to Pakistan on the invitation of the government. Rustam Ali, a resident of Yasin valley, declared Sunday the happiest day of his life when he had an opportunity to have Didar of his spiritual leader Aga Khan, the 49th imam of Ismaili Muslims, in his native village. “It is our obligation to host all relatives and friends who come for Didar of our spiritual leader in our area,” he said. He said the local people had not only vacated their homes for outsiders but also set up tent villages to accommodate the guests. 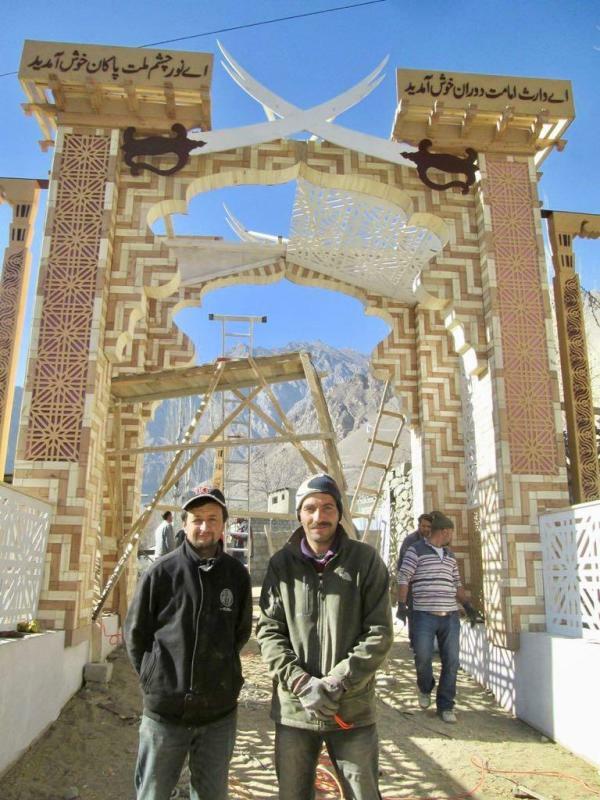 Welcome camps had also been established at various places across Gilgit-Baltistan and banners displayed along the roads on arrival of the prince. Personnel of GB Scouts, police, and Pakistan Rangers had been deployed at various places to ensure foolproof security for the events. Earlier, Chief Minister Hafeezur Rehman, cabinet members and military and civil officials received the prince at the Gilgit airport. 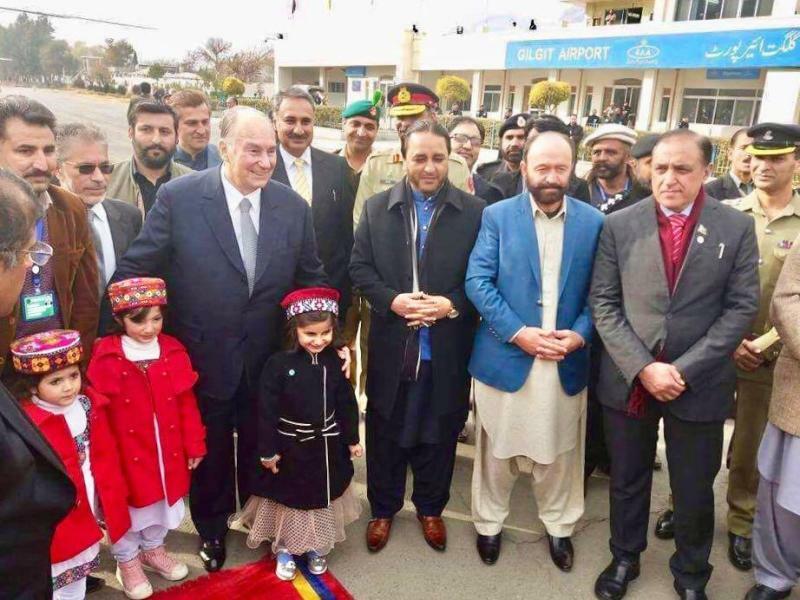 Faizullah Faraq, the GB government spokesman, said the people had set an example of religious harmony on arrival of Prince Karim Aga Khan in the region. He said people belonging to other sects had also displayed welcome banners and helped in the arrangements for Didar rituals. He said the government had helped set up Didargahs in Yasin and Ghizer. Why are we so caught up in theological disputes and issues that are best left between a person and his or her God? His Highness Aga Khan-IV, the hereditary imam of the Ismaili Aga Khani community, is on a visit to Pakistan. To my mind he represents the true spirit of Islam: progress, humanity, education, and economic progress as ethical imperatives and dictates of Islamic doctrine. As a religious leader can there be a greater contrast that what he is to the mad mullahs who have taken this nation hostage and who want to burn down things in the name of great faith. His Highness Aga Khan-IV founded Aga Khan University Hospital in Karachi, which is by far the best hospital in Pakistan. His Aga Khan Development Network has done great work sustaining communities in need of help by providing much needed humanitarian assistance in remote areas of Pakistan and other countries in the world. This assistance is provided without regard to religion, sect or ethnicity. The contributions of this industrious community to this land date back to the time that the present Aga Khan’s great great grandfather Aga Khan-I settled in Jhirk, the town on the bank of Indus in Sindh in the mid 19th century. Following in his footsteps came his followers from Gujarat. Among them was the father of a young merchant called Poonja Jinnah bhai. The significance of this should not be lost on those of us who are familiar with history. Aga Khan-III Sir Sultan Muhammad Shah, the grandfather of the present Aga Khan, was the founder-president of the All India Muslim League and the first chancellor of the Aligarh Muslim University. Without these institutions, Pakistan would not have been possible. Ever since the founding of this country, the Aga Khani Ismailis have played a significant role in health, education and business. The contributions made to this country by Aga Khani Ismailis like Sadruddin Hashwani are second to none. Given this illustrious example, it remains an unanswered question as to why other Muslims are unable to follow suit. Why are we so caught up in theological disputes and issues that are best left between a person and his or her God? Sure there can be guidance by religious teachers but must this result in fatwas leading to violence and death? The Holy Quran says “there is no compulsion in religion” (Al Quran 2:256). A well known though widely disputed hadith of the Holy Prophet (PBUH) says “My Companions are like the stars in the sky. You will find the truth no matter from whom among them you receive hadiths. Difference of opinion of my Companions is a mercy for you.” (al-Ajluni, Kashfu’l-Khafa, I/64; al-Munawi, Faydu’l-Qadir, I/210-212). Difference of opinion therefore was encouraged in early Islamic tradition. It was through this difference of opinion on almost all matters under the sun that Islam ushered in a truly enlightened civilisation from 7th century to 15th century. In this civilisation not only was diversity of views respected but encouraged. Not only that but a key pillar of this civilisation was the idea of religious toleration long before these ideas took root in Europe. Jews and Christians lived and worshipped freely in Spain, the Middle East and the Ottoman lands under Muslim rule. The Indian subcontinent retained its overwhelming Hindu majority despite almost 800 years of unbroken Muslim rule. Muslims of the 21st Century ought to be the inheritors of these glorious pluralistic traditions of Islam. Instead we have chosen to present ossified dogma in form of dated interpretations of long dead jurists, orthodoxy and narrow-mindedness as the real face of Islam. In Pakistan by making the legislative process subservient to the repugnancy clause, which in turn is based on these dated interpretations of a great and progressive faith, we have done untold harm to the process of Ijtehad, which is the inherent and inbuilt mechanism of renewal of Islam as a live religion. By the same token our so-called religious leaders have conflated the idea of Jihad or struggle to Qital or killing and have now made the word synonymous with violence and mayhem. Instead of being struggle for justice and general good, Jihad now is taken to mean aggressive holy war. It goes without saying that many Muslim communities on the periphery of the mainstream question this idea. There is great diversity in Islamic thought and discourse. Sir Syed Ahmad Khan, the great Muslim modernist and the intellectual forerunner of the Two Nation Theory and the Pakistan Movement, was also a great theologian. Some of what he expounded would today be considered most controversial. Sir Syed Ahmad Khan’s most prolific critic was another Muslim modernist Jamaludin Afghani who considered Sir Syed to be a British stooge. Sir Syed was a rationalist to the core going as far as to question the mode of prayer. His followers from the Aligarh school tried to reconcile modernity with their Muslim identity. The Indo-Muslim Nationalism that was to become the basis of the Pakistan Movement was born out of these efforts. The newly educated class of Muslims produced here wanted jobs and a share of economic resources. Their concerns were worldly and secular as opposed to being theological or religious. Meanwhile the Ulema who opposed them did so for multiple reasons. There were those like Maulana Maududi who saw the people demanding Pakistan to be too irreligious and modern and therefore unfit to lead Muslims. Then there were those in the Majlis-e-Ahrar who attacked the Muslim League because it was open to Ahmadis, Aga Khanis and Shias. However there were also those like Maulana Hussain Ahmad Madani of Deoband who had their own ideas of coexistence and pluralism of a United India emanating out of the prophetic tradition and Mesaq-e-Medina. LUMS Professor and historian Ali Usman Qasmi has collaborated with Megan Eaton Robb to bring out a fine volume called “Muslims against the Muslim League” to document the Muslim critics of the Pakistan idea. It is a fascinating read even for those people like me who intellectually support the creation of Pakistan and the Muslim League’s politics from 1940-1947. This book deserves a detailed review, which I intend to undertake in a future article, because it shows that the Muslim community has never been a monolith. Nor can it can be divided into good Muslims and bad Muslims because ultimately this community like any other is made of individuals with their unique ideas about religion, politics and life. Instead the Muslims need to celebrate diversity of views in the global community on everything from politics to theology. The surest way of doing this is to separate religion from state. This is what Mr Jinnah’s famous 11 August speech was about. Islam in this modern age can coexist with a secular state be it a Muslim majority state or where Muslims are in a minority. Recognising this is key to progress in the Muslim world. Published in Daily Times, December 11th 2017. A delegation comprising of government officials including Hafiz Hafeez-ur-Rehman, Chief Minister, Gilgit-Baltistan, Major General Saqib Mahmood Malik, Force Commander Northern Areas, Dr Kazim Niaz, Chief Secretary Gilgit-Baltistan, and others along with community leaders gathered to receive him at the Gilgit airport. On the occasion, the delegation applauded the significant role and longstanding commitment of Aga Khan Development Network (AKDN) in the development of Gilgit-Baltistan. Over several decades, the AKDN has invested in the areas of education and health as well as emergency and disaster preparedness, infrastructure and rural development in Gilgit-Baltistan, serving communities of all backgrounds. Mawlana Hazar Imam thanked the delegation, remarking much had been achieved towards the development of Gilgit-Baltistan and efforts would continue to be made towards the improvement of the quality of life for all in close collaboration with the government. Karachi: (December 14th, 2017) Sindh Chief Minister Syed Murad Ali Shah receives His Highness Prince Kareem Aga Khan at old Terminal. KARACHI: The spiritual leader of Shia Imami Ismaili community Prince Karim Aga Khan arrived in the city on Thursday and was received at the airport by both the Sindh Governor Mohammad Zubair and Chief Minister Syed Murad Ali Shah. Sindh Information Minister Syed Nasir Hussain Shah, Inspector General of Sindh Police AD Khowaja, and other high-ups of provincial government were also present on the occasion. Sindh governor expressed his delight and welcomed the arrival of the spiritual leader of the Ismaili community. Zubair said that Aga Khan Foundation is rendering important services in the socio-economic sectors of the country. He also lauded the services of the Ismaili community in education and health sectors. He said the arrival of Prince Karim Aga Khan in the city, soon after the visit of Karachi by the spiritual leader of Dawoodi Bohra community has proved that the law and order situation of the provincial capital has improved. On the occasion, Sindh chief minister also discussed matters of mutual interest with the visiting dignitary. A statement issued by the spokesman for Sindh Governor House said that Prince Karim Aga Khan was taken to Governor House from the Karachi Airport. The Sindh governor hosted a dinner reception in honour of the visiting dignitary, which was attended by prominent people from different walks of life and members of the Ismaili community. The dignitary is expected to stay in the city till 19 December, 2017 during which among other engagements, he will address members of the Ismaili community at different Jamaat Khanas. Aga Khan has been on the visit to Pakistan since 07 December, 2017. Meanwhile, Inspector General Sindh AD Khowaja reviewed the overall law and order situation of the province including security of Prince Karim Aga Khan in a meeting held at Central Police Office on Thursday. The meeting was attended by Additional Inspector General of Special Branch , DIG Operations, zonal DIGs, SSP Special Branch and others senior police officers. Khowaja directed participants to ensure security of citizen’s life and property and implementation of the contingency plans prepared for the security of Prince Karim Agha Khan in letter and spirit. He directed DIGP Traffic to ensure smooth flow of traffic during the busy hours. The IG also ordered to strictly enforce the timings of movement of heavy traffic in the city. KARACHI: Sindh Governor Muhammad Zubair and Sindh Chief Minister Syed Murad Ali Shah Thursday warmly received and welcomed spiritual leader of Shia Ismaili Community Prince Karim Aga Khan at Karachi Airport. According to a spokesman for the Governor House, the Governor, on the occasion, said that he wholeheartedly welcomes Prince Karim Aga Khan to Karachi. He said that on the directives of Prince the Aga Khan Foundation is doing well in social welfare sector in Pakistan. He further said that the services of Ismaili Community in the field of heath and education are appreciated. The Governor said that the arrival of Prince Karim Aga Khan after the visit of spiritual leader of Bohra Community to Karachi speak volumes about the law and order situation in the city. Prince Karim Aga Khan will stay at the Governor House, the spokesman added. Arrival of His Highness The Aga Khan. On arriving in Karachi, Mawlana Hazar Imam was warmly welcomed by Muhammad Zubair, Governor of Sindh, and Syed Murad Ali Shah, Chief Minister of Sindh. Key government officials, community leaders and Junior Guides and Shaheen Scouts from the Sindh Jamat were also present to welcome Hazar Imam. Upon his arrival, Hazar Imam held a meeting with government officials at the airport’s lounge where they discussed topics of mutual interest. Later that evening, Muhammad Zubair hosted a dinner in honour of Hazar Imam and his delegation at the Governor’s House, where Syed Murad Ali Shah and other dignitaries were also present. KARACHI: Prince Karim Aga Khan, the spiritual leader of the Ismaili community, was accorded a warm reception on his arrival here on Thursday. The Aga Khan was received at Quaid-i-Azam International Airport by Sindh Governor Muhammad Zubair and Chief Minister Syed Murad Ali Shah. The governor and the chief minister later held a meeting with him at the airport’s lounge and exchanged views with him on the topics of mutual interest. Provincial Minister Syed Nasir Hussain Shah, Chief Secretary Rizwan Memon and Inspector General of Sindh Police A.D. Khowaja were present on the occasion. 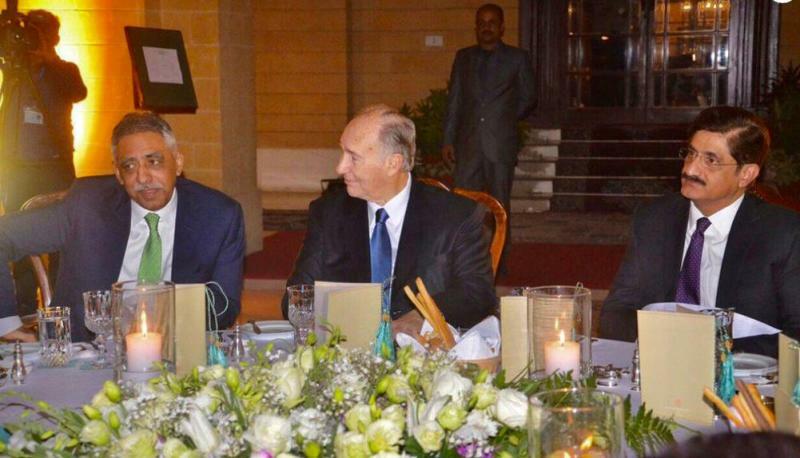 Later in the day, Governor Zubair hosted a dinner in honour of the Aga Khan at the Governor’s House which was attended by notables of the city and members of the Ismaili community. The Aga Khan would be the chief minister’s guest at the CM House on Saturday. 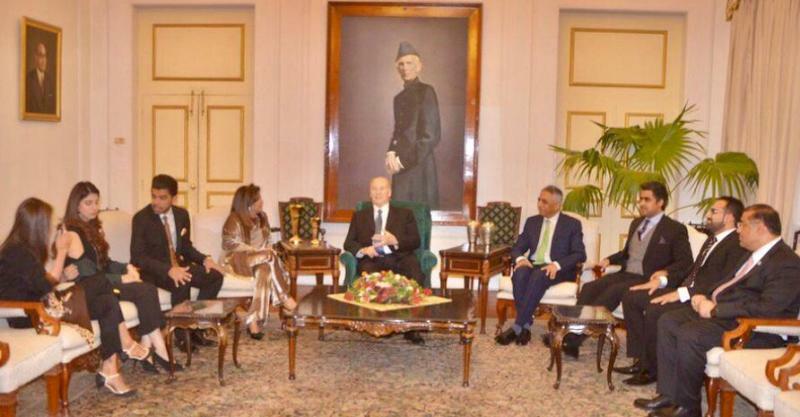 The spiritual leader of the Ismaili community arrived in Islamabad on Dec 7 on a 13-day official visit to the country on the invitation of President Mamnoon Hussain. CM Murad Ali Shah hosted reception for Prince Karim Aga Khan!